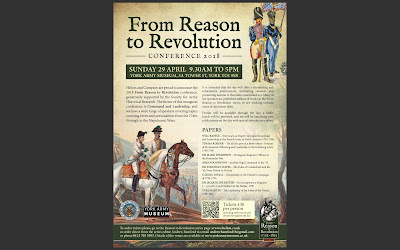 Carryings On Up The Dale: From Reason to Revolution - what could be an interesting day out. From Reason to Revolution - what could be an interesting day out. The sessions on Flanders and the Helder campaign are of particular interest to me so I am hoping to go to the event as its only half an hour on the train once we've moved to the 'Boro. Sounds like a good day out. Shame it's too far away otherwise I might be interested. Very envious Colin. Sounds very interesting and you’ll have young Graham for company as well so it sounds like a grand day out. Good spot. Now could I sneak this in without the wife knowing. £30.00 seems like a bargin.